Bread and butter pudding is like a gourmet food in United Kingdom, which has been favorite of English man from generations. 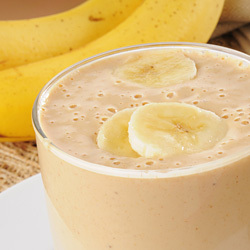 Due to its awesome taste and ease of preparation, it is one of the widely preferred “make at home” recipes. It can only be made at home, as you will have complete control over its preparation to bring out the desired taste and crispiness. Learn how to make this pudding in simple and easy steps at home with this recipe and pamper your taste buds. Remove crusts from the bread and spread butter on both sides of all slices. Cut each slice into 4 triangles. Grease 1-liter ovenproof dish with butter. Arrange bread triangles in slightly overlapping layer in it. Sprinkle half of golden raisins, brown raisins and a pinch of cinnamon over it. Make one more layer of slightly overlapping bread triangles and sprinkle remaining golden and brown raisins and ground cinnamon in between layers. In a large saucepan, combine milk and double cream and cook over low heat for 1-2 minutes until warm. Make sure not to boil it. Beat eggs with 1/4 cup sugar and vanilla extract until light and smooth. Pour warm milk in small amounts over it and keep beating continuously until all milk is added. Pour prepared custard evenly over arranged bread triangles. Press them a bit with spoon to soak in egg and milk liquid. Sprinkle 1-tablespoon sugar evenly over it and keep aside to rest for 20 minutes. Meanwhile preheat oven to 180°C / 350°F. Place it in preheated oven and bake for 35-40 minutes until its surface is golden brown and pudding is set. 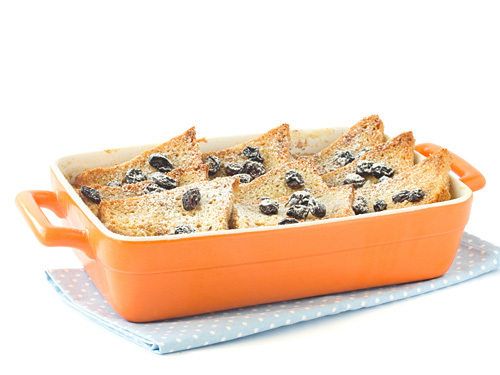 Take out hot bread and butter pudding from oven and let it cool for 5 minutes. Garnish with powdered sugar and serve warm. Use one-day-old bread to make a crispy pudding. Sprinkle grated nutmeg over it for variation in flavor and aroma. To get evenly moist bread in the bottom layer, you can also arrange one layer of bread first and then pour custard over it and then arrange another layer of bread and again pour custard over it. Taste: Soft and sweet with crunchy bread edges and outer layer. The use of double cream in this recipe makes custard creamier and smoother. Serving Ideas: This pudding can be served with whipped cream. It also tastes awesome with custard.